MySurveillanceGuardian provides a managed video surveillance that permits safe and secure offsite storage. This alleviates not only resources for on-site storage but also lessens unnecessary time spent trying to retrieve specific videos. MySurveillanceGuardian techs will retrieve the timeframe that is requested. 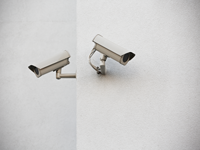 MySurveillanceGuardian offers a 24×7 support should any of the cameras stop running. In this event a service tech will be dispatched to either fix or replace the non-functional equipment so that video surveillance downtime is to a minimal. Regularly scheduled maintenance of the system and equipment will be perform to ensure longevity and functionality of the system. MySurveillanceGuardian creates a safe and secure system to safeguard your video surveillance so unauthorized access or removal of data will be eliminated. With MySurveillanceGuardian, you will have access to the video surveillance system where ever you are, through a desktop, laptop or smartphone. This accessibility is essential to those businesses that monitor and view the productivity in real time. There are various companies and many reasons why they use MySurveillanceGuardian, but the #1 reason why they use it is for “Security”. These are just a few of the many benefits offered by MySurveillanceGuardian.